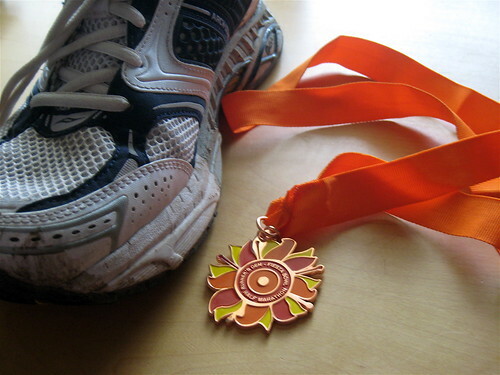 Award for completing the 2007 Fiesta Bowl Half Marathon, in Scottsdale (2:21 slow going!) — this is just the half way in prep for my first Marathon a month from now. I’ve casually watched, and greatly impressed, by the ways people are using web technology to raise money for causes- Beth Kanter has not only documented this to a tee but done some tremendous world building good in her efforts to help send Cambodian students to college. Stuff that matters. So I will give it a try, but certainly with not all the clever chip-in campaigns and Facebook/Twitter strategizing that Beth perfected– I’ll just resort to old fashioned begging for contributions. As my own personal challenge, because I have always hated running, 2 years ago I took on running my first half marathon- and to prep for this I luckily managed to find a local group here, Team Diabetes here that offers training in return for participants raising funds for the American Diabetes Association– all very fitting since I have been diabetic myself for 37 years. I still don’t like running. For those first 2 fund raisers, I pretty much emailed everyone I knew, friend, family, and people graciously responded, so I raised about $3200 over the last 2 years. I even got a $100 pledge from someone I did not know, who had found my blog will googling on “diabetes” and was moved because his teen son was recently diagnosed. But I know that feeling when I sponsor someone onces for a charity walk/run/ride, and they keep coming back each year… when I hear from Paul in October it’s because he wants a pledge… going back to the well. So this year I decided on a different tact. I would not pester any of my friends or family. I actually got lucky, and got a consulting gig that pretty much provided the funds to meet my minimum amount to be on the team. But minimum is pretty… well minimal. So I am trying this tack, of asking people I sort of know, or don’t know, to ask for support so I can at least bump my contribution up another $500 (or more, hey? )– by putting it on my blog. Actually I have had a link on the signature of my GMail account for a few months, but so far the only action on my web form were some bogus $5 pledges from spammers fishing in the web forms (and they never coughed up the dough, cretins). These days, with the increasing rates of diabetes, its hard not to know a family member, friend, co-worker affected by the disease. My blog has a whole set of random facts and trivia if that helps. Or that our local group that runs this is very grass roots and does not spend much of anything, so 87% of the funds raised go directly to research, education, etc. Or maybe if I just beg, pretty please? with sugar free substitute on top? There is an option for a secure credit card method contribution that goes directly to the ADA. Or even if you don’t have the funds, just an encouraging comment (and I loathe that spammers shall follow the link, oh well). I will ask only once. And then I will run on January 13. And probably will not like it. Would the NMC consider donating some space (time ) for the FLNW cuase this coming January ? A round table = your logo in there with the others. Would be great to catch up with you otherwise. You are still doing personal fundraising – and great work. I’m going to make you a small donation. one more thing – why didn’t you hyperlink your blog over at the site … make it easy for us to respond to your begging! Pingback: I Hate Running » Blog Archive » The Twitterverse Responds!